Making Treaty 7 on stage at the National Arts Centre for Canada Scene. 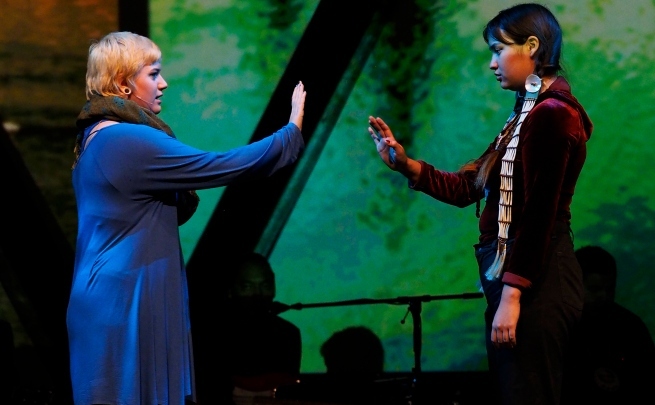 Another performance focusing on Indigenous storytelling hits the NAC this week. Making Treaty 7 follows Children of God, a play about the experience of residential school, and the opera Louis Riel, both of which were on stage last week. Making Treaty 7 is a breathtaking collaboration . . . an incredibly important and moving depiction of the history of Southern Alberta. The Performance is Pay What You Can and tickets can be purchased here.